SYLHET, Dec 06: Amid a good harvest of Transplanted Aman (T-Aman) paddy in Sylhet division this year, the Food Department has set a target of procuring 22,883 tonnes of rice from the region. The rate has been fixed at Tk 36 per kg, an official informed on Thursday afternoon. However, it would be done through listed millers only while the farmers demanded for the chance to supplying paddy to the government. An official at the office of Regional Controller of Food, Sylhet division told this correspondent that of the total target, highest 7,064 tonnes of parboiled rice would be bought from dealers in Sylhet while 5780 tonnes from Moulvibazar and 5,126 tonnes from Habiganj in addition to 4,913 tonnes from Sunamganj district. Signing of contracts with the millers is on at district level, the official informed further, the procurement would continue till end of February. Meanwhile, the DAE officials expects production of a total of about one million metric tonnes of T-Aman paddy this year as there has been good yield. Although there had been some sporadic attack of pests in different areas, it did not affect much. So far about 35 per cent of the crop is harvested since this region has to cultivate the crop albeit late. A good number of farmers expressed dissatisfaction with the decision of procurement through millers only. Besides, they demanded decision for procurement of paddy from the farmers directly at a better rate. Farmer Abdul Hasib of village Baushi in Golapganj said we want the food department to buy paddy from us, since there had been a good yield, but the price is not at all satisfactory. 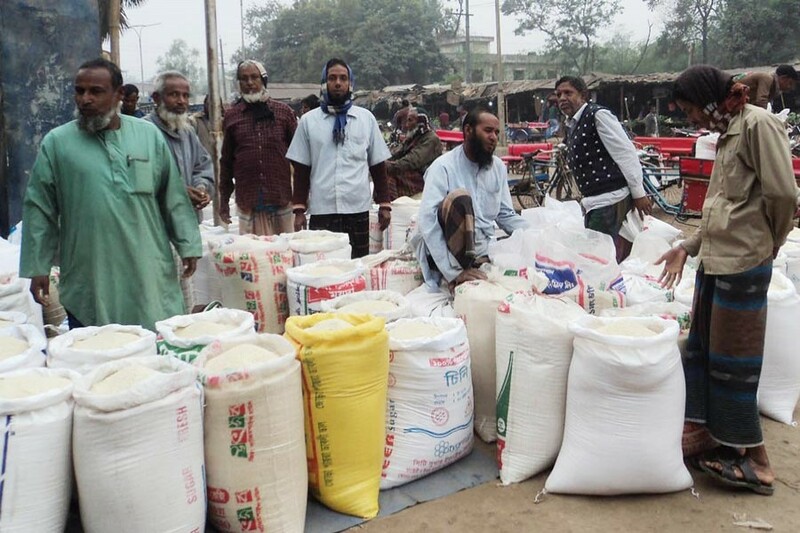 However, in the last year the Food Department procured 1,213 tonnes of rice from Sunamganj and Moulvibazar districts and Sylhet and Habiganj districts were dropped for unknown reasons. In the previous year's Aman season a total of 9237 tonnes of rice were procured in four districts of the division. Meanwhile, our roving correspondent from Natore adds: Prices of newly-harvested Aman rice has fallen in the northern eight districts. Sources said after launching the government's food-friendly programme from the first day of December, rice prices started falling down. Within a gap of 12 days, the rice price has declined by Tk 5.0 to Tk 6.0 per kg. In a recent visit in some retail markets in Natore, Sirajganj, Pabna, Joypurhat and Bogura the correspondent found the farmers were worried due to acute price fall. The price of coarse rice has also reduced by Tk 2.0 to Tk 3.0 per kg.